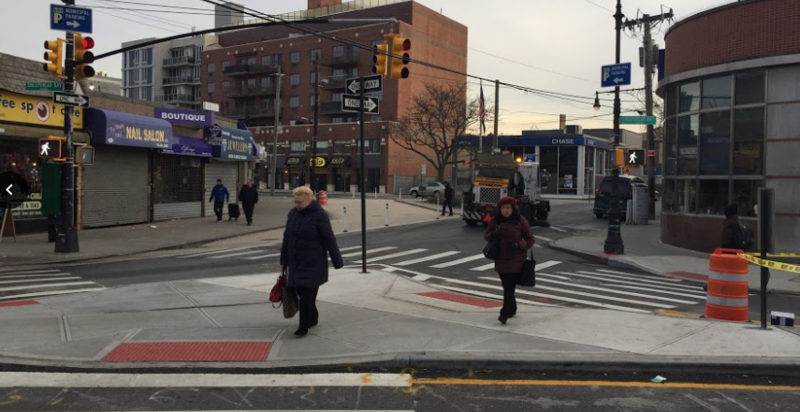 A DOT safety project in Sheepshead Bay is in effect after a rocky path to implementation that was slowed down by local Council Member Chaim Deutsch and Community Board 15. 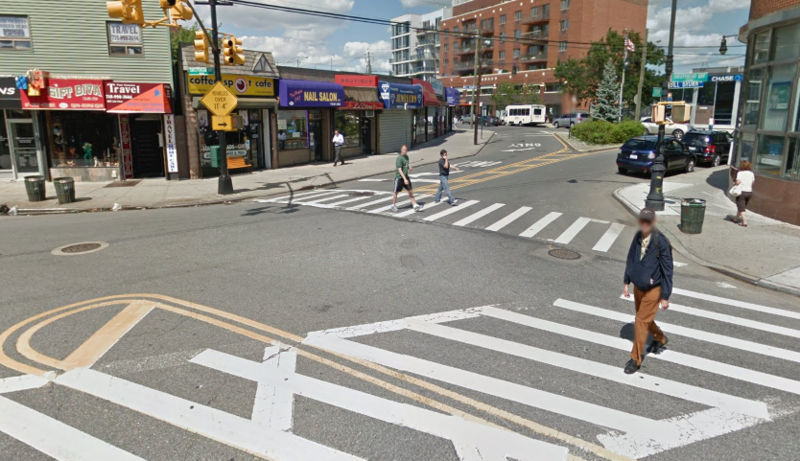 The project includes two new pedestrian spaces: one on E. 15th Street linking bus riders to the subway entrance, and another claimed from a former slip lane off E. 17th Street onto Sheepshead Bay Road. 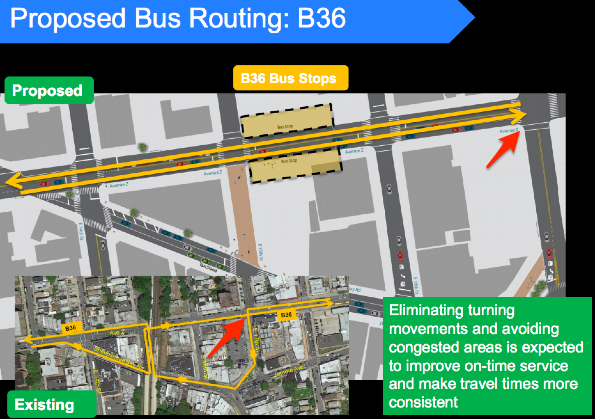 The project also speeds up the B36 bus by straightening out its route. 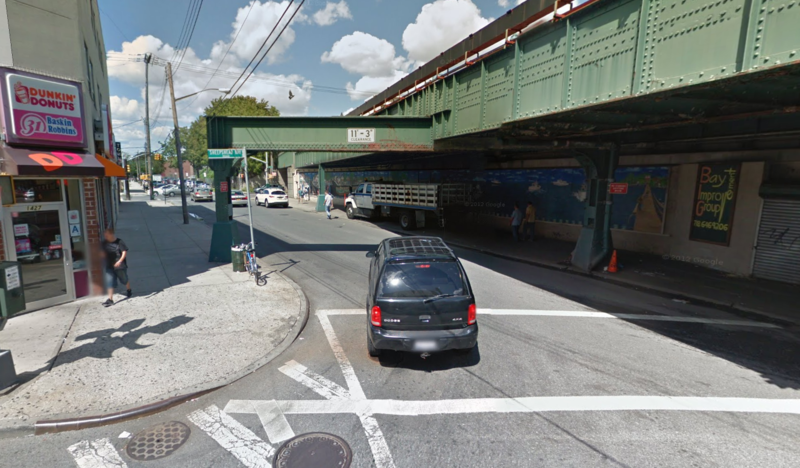 Instead of detouring from Avenue Z to the subway station on Sheepshead Bay Road, the bus now stays on Avenue Z [PDF]. The elimination of bus turns at intersections with lots of people on foot will also reduce dangers for people on foot. If the project had been implemented sooner, it might have saved the life of 62-year-old Eleonora Shulkin, who was struck and killed by a bus driver making a turn along the detour by the subway station last December. DOT had presented the plan several months earlier but withdrew it in response to opposition from CB 15 and Deutsch. After Shulkin’s death, CB 15 and Deutsch remained opposed, while DOT insisted on moving forward with implementation. East 15th Street and Avenue Z are both priority streets in the city’s Brooklyn pedestrian safety action plan because of high injury rates. Between 2009 and 2013, 74 people were injured within the project area, according to city crash data. Before the changes were implemented, Sheepshead Bay Road was a chaotic mess, with buses, pedestrians, and livery drivers all competing for road space outside the station. The rerouting of the B36 and elimination of westbound car traffic between Jerome Avenue and E. 15th Street has reduced conflicts and created safer walking conditions on the blocks by the subway.